Senate Republicans and the White House sounded ready to abandon efforts to repeal and replace the nation's health care law, at least for now. WASHINGTON: Senate Republicans and the White House sounded ready to abandon efforts to repeal and replace the nation's health care law, at least for now, even as House Republicans insisted on Tuesday they were not ready to give up on their years-long quest. The intraparty dispute came in the wake of last Friday's collapse of health care legislation in the House, a GOP humiliation at the climactic moment of seven years of promises to get rid of former President Barack Obama's Affordable Care Act. Senate Majority Leader Mitch McConnell, R-Ky., made his views clear after a closed-door lunch with fellow Senate Republicans and Vice President Mike Pence. "It's pretty obvious we were not able, in the House, to pass a replacement. 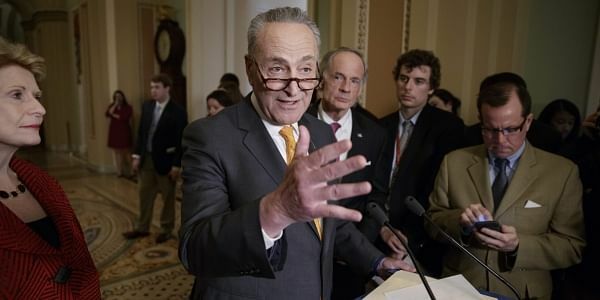 Our Democratic friends ought to be pretty happy about that because we have the existing law in place, and I think we're just going to have to see how that works out," McConnell said. "We believe it will not work out well, but we'll see." "I want to thank the president and the speaker, they went all out to try to pass repeal and replacement. Sorry that didn't work," McConnell added. White House legislative affairs director Marc Short also emerged from the Senate GOP lunch indicating the administration was moving on despite President Donald Trump's promises as a candidate to immediately get rid of Obama's law. "We understand there's probably members in Congress who feel like 'Look, we probably need to revisit this, and we need to make an effort to get it done,' and if that's the case, if the legislation reaches the president's desk, I'm sure he'll look to sign it," Short told The Associated Press. "But at this time, at this time today, there are other things that we have on our priority list that we're moving on to." Short pointed to the confirmation of Supreme Court nominee Neil Gorsuch, whose nomination will be on the Senate floor next week, as well as a looming funding deadline on April 28 that must be met to keep the lights on in the government. Short said that "of course" the White House hopes to avoid a shutdown. And, senior Republicans and the White House are eager to move on to tax overhaul legislation. The comments on health care from Senate Republicans and the White House were a cold reality check on the newly revived hopes of House Republicans. Just this Friday, House Republicans couldn't muster the votes for their marquee legislation to repeal and replace the health care law and pulled it off the floor in an embarrassing setback for Trump and Speaker Paul Ryan. But Tuesday morning, they exchanged pledges of unity in a closed-door meeting and emerged eager to continue their efforts on health care, although they provided no specific plans or timeline for how they would proceed. Ryan proclaimed, "We are going to work together and listen together until we get this right. It is just too important." House Majority Leader Kevin McCarthy, R-Calif., said: "We promised that we would repeal and replace Obamacare, and that's exactly what we're going to do." And House Majority Whip Steve Scalise, R-La., claimed: "I think we're closer today to repealing Obamacare than we've ever been before." Those comments landed with a thud on the Senate side. Asked if it were realistic for the House to try to revive its health care legislation, Sen. Pat Roberts, R-Kan., said: "No. I'm about health cared out." The discussion on health care came with a hard deadline looming to pass legislation by the end of next month to keep the government running. GOP leaders in Congress and at the White House were trying to take steps to avoid stumbling into a shutdown. Ryan said Tuesday that any provision to "defund" Planned Parenthood didn't belong in the catchall measure, while Senate GOP leaders like Roy Blunt of Missouri made clear they'd like to avoid a showdown over Trump's border wall, which is loathed by Democrats and disliked by some Republicans as well. Keeping Planned Parenthood and the border wall out of the spending bill would greatly improve its chances to get necessary Democratic votes in the Senate, although conservatives in both chambers might object.